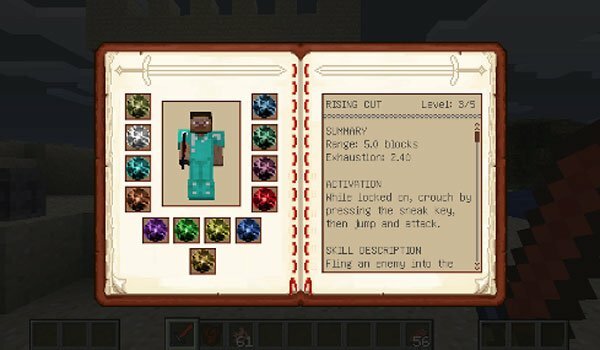 Learn new attack and defense skills for your battles in Minecraft. Dynamic Sword Skills 1.12.2 and 1.11.2 is a simplified version of Zelda Sword Skills, for those who want new fighting skills for your character in Minecraft, but do not want to be related to objects of the Zelda games. This mod gives us a system of orbs that you gan get when killing enemies. These orbs will allow you to learn various skills that can be used later in our battles. There are several powerful abilities, from attacks, defensive skills and area attacks that damage all enemies arround you. In the following video you can see the different key combinations required to use these new skills. How to install Dynamic Sword Skills Mod for Minecraft 1.12.2 and 1.11.2? Learn new skills for your battles!